The provision of safe, sustainable and resilient services to meet the needs of the population of Northern Ireland is a key priority for me as Minister for Health, Social Services and Public Safety. My vision is to drive up the quality of care for patients, clients and service users, improve outcomes, and enhance the patient experience so that people are treated in the right place, at the right time and by the right people. This vision is, I believe, shared by the people who deliver services daily throughout our health and social care system. • Difficulties recruiting and retaining skilled staff in areas of Northern Ireland, mean that we need to think differently to meet the demands that lie ahead. Although these changes present us with challenges, they also offer us opportunities to look innovatively at how we can reform and modernise our services to meet the changing needs of our society now and into the future. Without change there is a growing potential for instability in the Health and Social Care system and increasing difficulty in meeting the future needs of our citizens. What has not changed is my belief in the principles of the NHS and the core objectives of what our Health and Social Care system is there to do. To address the impact of these changes I commissioned a review into how we could improve the delivery of health and social care and reshape the delivery of those services. The review examined the provision of Health and Social Care (HSC) services in Northern Ireland. It provided a strategic assessment across all aspects of health and social care and the extent to which the future needs of patients, clients, service users and the wider community would be addressed. The Report entitled “Transforming Your Care” (TYC) was published in December 2011. It set out a compelling case for change and provided a strategic direction for the future of health and social care services in Northern Ireland. The proposed changes across Health and Social Care focus on reshaping how services are structured and delivered in order to make best use of all resources available and in so doing ensure that our services are safe, resilient and sustainable into the future. • Who Cares? -The Reform of Adult Care and Support It is vital that we make the decisions and take the actions that are necessary to improve the outcomes for patients and clients. change in how we plan services and change in how we deliver them. It is about reforming and modernising services so that they are focused on the people for whom care is provided, rather than on the institutions which provide it. A consultation on proposals emerging from ‘Transforming Your Care’ was recently completed. A wide range of engagement opportunities were organised in support of the consultation – this included public meetings, social media and feedback via an online questionnaire or in writing. These activities sought the views of the public, as patients, clients, services users, service providers and citizens on the proposed changes. The responses have been analysed and a report of the findings will be published shortly. This is only the first step in the process and further public consultation will be undertaken on any significant service changes proposed in light of the conclusions from the consultation. There will be many challenges in implementing the required changes but I remain confident that the healthcare professionals involved, will deliver safe, sustainable and resilient services to meet the needs of the population of Northern Ireland. Responsibility for health, healthcare and social care is largely devolved, with only a few legislative and/or operational areas remaining reserved to the UK. The Scottish Government has considerable experience and success in delivering high quality and sustainable services for the people of Scotland which is already recognised internationally as world-leading. Our record of achievements includes those that have not only led the way in the UK (for example legislation to ban smoking in public places, in improving patient safety and massively reducing waiting times and delayed discharge from hospital) but which are recognised internationally as innovative and aspirational in their scope and potential for improving health and healthcare. ‘We will have a world-leading healthcare service where everyone is able to live longer and healthier lives at home, or in a homely setting. We will have a focus on reducing health inequalities, on prevention, anticipation and supported selfmanagement. When hospital treatment is required, care will be provided to the highest standards of quality and safety, with the person at the centre of all decisions. There will be a focus on ensuring that people get back into their home or community environment as soon as appropriate, with minimal risk of re-admission.’ We are fully committed to a publicly funded and publicly delivered national health service. Our largely unified system allows responsibility to rest with NHS Boards for commissioning and providing quality services, for both of which they are properly held to account. • a commitment to work in partnership with industry and the research community to use innovation to drive improvements in the quality of healthcare. The mutual NHS in Scotland does not seek to promote competition. In Scotland, effective and efficient health provision is ensured by a variety of other means, including efficiency and productivity teams centrally and in each NHS Board. In Scotland, our focus, through implementation of the Quality Strategy, is to build mutually beneficial partnerships with people rather than to simply offer a choice of provider. Partnership in NHS Scotland stands out as a distinct approach. Policy is developed in collaboration between the Scottish Government, NHS Scotland and other partners and stakeholders. We have a strong history in and commitment to involving people in designing, developing and delivering healthcare services. In summary, our focus on improving quality in healthcare is our top priority and we believe this is the way in which we can really make a difference to the health, healthcare experience and ultimately to the lives of the people of Scotland. The Welsh Government is committed to improving the health of people in Wales. As Minister for Health and Social Services I am proud to lead the Welsh National Health Service (NHS), which provides free care at the point of need. Health was devolved from the Westminster government to Wales in 1999, with enhanced legislative powers granted in 2007. This has enabled us to put in place a number of innovative policies for the benefit of our citizens. Life expectancy in Wales has been improving for the past two decades, but there is still more work to be done. As the birthplace of the founder of the NHS, Aneurin Bevan, Wales has a proud healthcare history. The Welsh Government has led the way on bold, progressive public health decisions. Wales was the first country in the UK to vote for a ban on smoking in public places and the first to introduce free prescriptions. In keeping with this, the Human Transplantation Bill was introduced to the National Assembly for Wales in December 2012, another landmark for Wales as the first UK administration to introduce a “soft opt-out system” for consent to organ donation. I have been clear since my appointment in March 2013 that I am keen to steer this legislation to a successful conclusion. Other challenges we face in Wales include poorer health in some communities, a rising elderly population, more people with chronic conditions, a shortage of doctors and some specialist services which are spread too thinly. As with many countries at the moment, we are also experiencing unprecedented financial pressures. Our vision for the NHS in Wales is one which remains true to the principles of Aneurin Bevan, rather than relying on the marketplace and competition. Our approach focuses on collaboration and co-operation, using clinical leadership and transparent reporting to drive up standards. “Together for Health”, the Welsh Government’s five year vision for the NHS, was launched in November 2011. Developed with the help of clinicians and the trade unions, it describes how we will respond to the challenges we face and create something better for Wales – better health for everyone and an NHS which can reliably deliver safe, high quality, effective care and best outcomes for patients. The focus of our vision is to move care from hospitals into primary and community care wherever possible, with new technology such as tele-medicine playing a major part. While district general hospitals will retain an essential role, “Together for Health” sets out the intention to establish centres of excellence, such as for cancer surgery or stroke care, to ensure the very best skills and equipment are on hand round-the-clock for the most complex, life threatening conditions. While health in Wales is improving overall, the average gap in healthy life expectancy between the most and least deprived parts of the country is 19 years for men and 18 years for women. We know that only 6 per cent of adults follow healthy lifestyles in the four main risk areas – maintaining a sensible diet, not smoking, drinking sensibly and taking regular exercise. 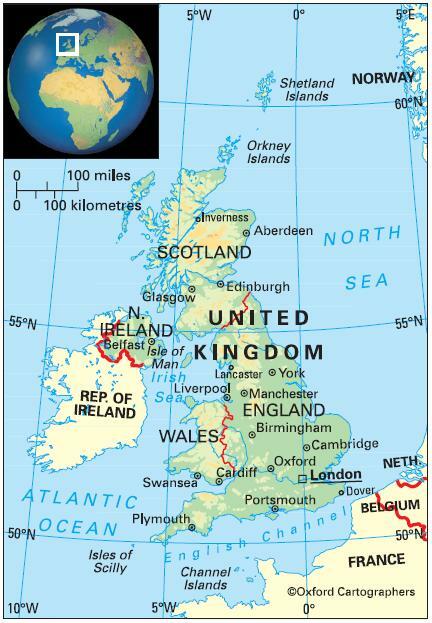 The United Kingdom of Great Britain and Northern Ireland (UK) consists of a group of islands off the western coast of Europe. The largest, Great Britain, comprises three countries: England, Scotland and Wales. Ireland, to the west, consists of the UK’s province of Northern Ireland and the Irish Republic. There are several offshore islands and island groups, the largest lying off Scotland. The UK is a union of four countries: England, Scotland, Wales and Northern Ireland. The Crown dependencies (the Channel Islands and the Isle of Man) are largely self-governing with the UK responsible for their defence and international relations and are not part of the United Kingdom. The climate is mild, cool-temperate and oceanic. Rainfall is generally heaviest between September and January. Air currents across the Atlantic are warmed by the Gulf Stream and make the rainfall unpredictable but also give the country a warmer climate than usual for its latitude. The northerly latitude gives long days in summer and long nights in winter. The most significant environmental issues are continuing reduction of greenhouse gas emissions in line with Kyoto Protocol commitments; air pollution, mainly by motor vehicles; and the need to recycle a progressively larger proportion of solid waste. 62,783,000 (2012); England 83.6 per cent, Scotland 8.6 per cent, Wales 4.9 per cent and Northern Ireland 2.9 per cent (2001 census); 80 per cent of people live in urban areas and 26 per cent in urban agglomerations of more than a million people. The population growth rate stood at 0.4 per cent p.a. between the years of 1990 and 2012. In 2012 the birth rate was 12 per 1,000 people (16 in 1970); and life expectancy was 80 years (72 in 1970 and around 50 in 1901). According to the 2001 census, the ethnic origins of the population are 92.1 per cent European; 4.0 per cent Asian (1.8 per cent Indian, 1.3 per cent Pakistani, 0.5 per cent Bangladeshi); two per cent Caribbean or African; and 0.4 per cent Chinese. The UK is classified as a high-income economy by the World Bank.